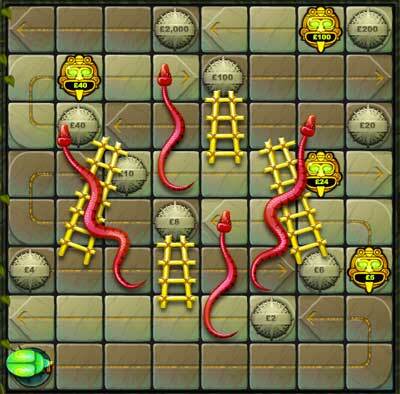 Aztecs 'n' Adders is an online real money version of the Snakes and Ladders board game. In Aztecs 'n' Adders you have 6 rolls of the dice to get as far up the board as you can, dodging snakes and hopefully climbing some rickety ladders as you go. The further up the board you travel, the more money you win. Despite Aztecs and Adders being an "okay" game, you know that you’ve hit a low point when you’re playing Snakes and Ladders on your own, and possibly not even for the first time. Even in real life with the likes of Cluedo and Monopoly out there, Snakes and Ladders was never going to make it as a top-tier board game. Snakes and Ladders will always be at the bottom of the pile, next to that Jigsaw puzzle with half of the pieces missing. 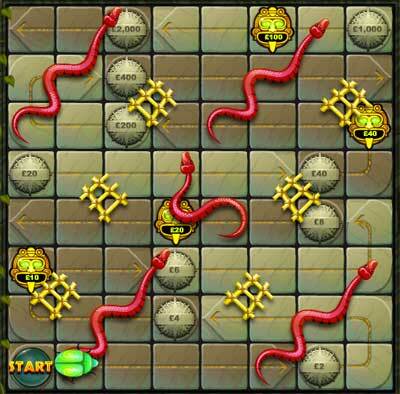 But despite the fact that Aztecs 'n' Adders was never destined to be a roaring success, it’s a fairly fun game to play if you like the format of a good ol' Snakes and Ladders. 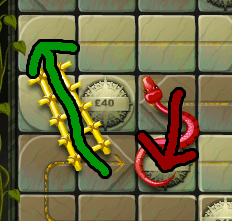 On the other hand, if you don’t really care for Snakes 'n' Ladders all that much (which I’m highly confident you don’t), then Aztecs 'n' Adders is just another sub-par fixed odds game with relatively small wins. The basics of Aztecs 'n' Adders. 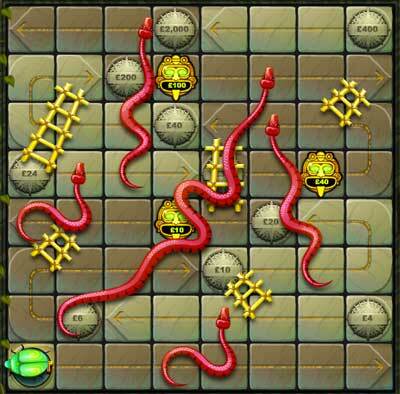 Select from 5 different Aztecs 'n' Adders boards to play. Roll the dice 6 times and try and get your counter (in the form of a bug) as far up the board as you can. The game ends if you reach the top of the board or after all 6 dice rolls have been made. 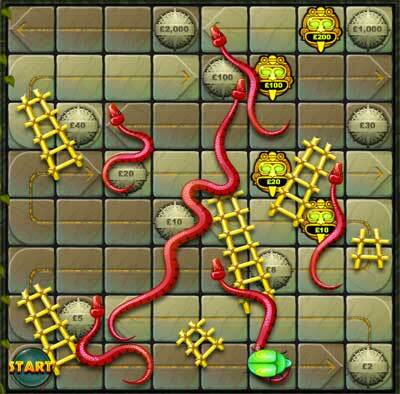 What else would you expect from a 1-player version of Snakes and Ladders? God forbid I need to explain the details of the game of Snakes and Ladders to you, but here are the basics for anyone that suffered from a completely board game-less childhood. Aztecs 'n' Adders in more detail. You have 6 rolls of the dice to move as far up the board as possible. Each number on the dice will move the bug 1 square along the board. The bug moves horizontally to the right and to the left, moving up one square once it reaches the end of a row. If you land at the foot of a ladder, the bug will climb to the top. If you land on the head of a snake, the bug will fall down to its tail. 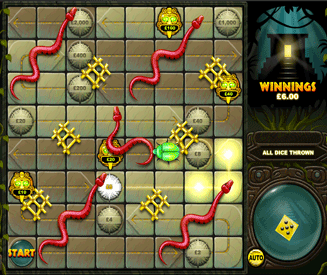 At certain points on the Aztecs 'n' Adders board you will pass money milestones as you progress. The more milestones you have successfully passed when the game ends, the more money you will win. Note: Just because you pass a milestone once, it doesn't mean that you are guaranteed to keep that money. It all depends on where your counter finishes at the end of the game. If you want to win a decent amount of money from Aztecs 'n' Adders you really need to hit those ladders and avoid the snakes. Obviously this is all out of your control anyway, but at least you now know what to hope for. In addition to the milestone squares that you want to try and pass, there are some bonus squares scattered across each board that will provide you with instant wins. If you land on a gold mask, you will automatically win the amount of money displayed on the mask regardless of where your counter ends up at the end of the game. Choosing from a number of different boards. There are a total of 5 different Aztecs 'n' Adders boards to choose from. 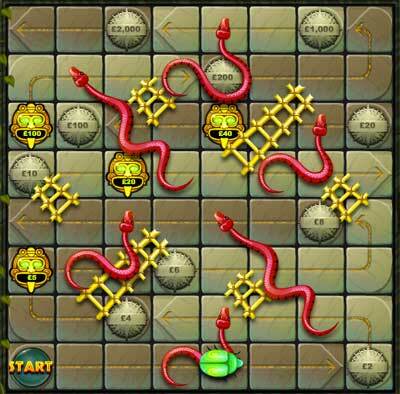 Each board has the same number of squares, but the layout of the snakes, ladders and money milestones is different. From my experience, no one board is more favourable than another. Therefore, each board has an equal chance of winning you money, so just go for the board you find the most entertaining to play. There is no strategy for Aztecs 'n' Adders as it is all purely luck. Unfortunately, you cannot sneakily move your counter when the computer isn’t looking either. In addition to this, none of the game boards are better than any other (from an odds perspective), so all you can do is roll the dice and hope for the best on any of the 5 boards.